It's been a while since I managed to sit down and write anything new. Not that I don't have lots to write about, just seems that with a wedding coming up, and things being rather busy with the day job, I've not had much time. Anyway, that said, here's a nice Karakuri box to give you something to read about. The Triskele is a puzzle box designed by Hideaki Kawashima. It's a beautiful looking puzzle, as you'd expect from the Karakuri group, and it hides it's secrets well. I spent quite a bit of time fiddling with this one, and seeming to make absolutely no progress on it. Only 25 of these were made for an exhibition that Kawashima was taking part in, so I believe from the Karakuri site, that these are reasonably rare. Kawashima notes that the mechanism is not his design, and he's not made this style of puzzle until now. So what is this you may ask? 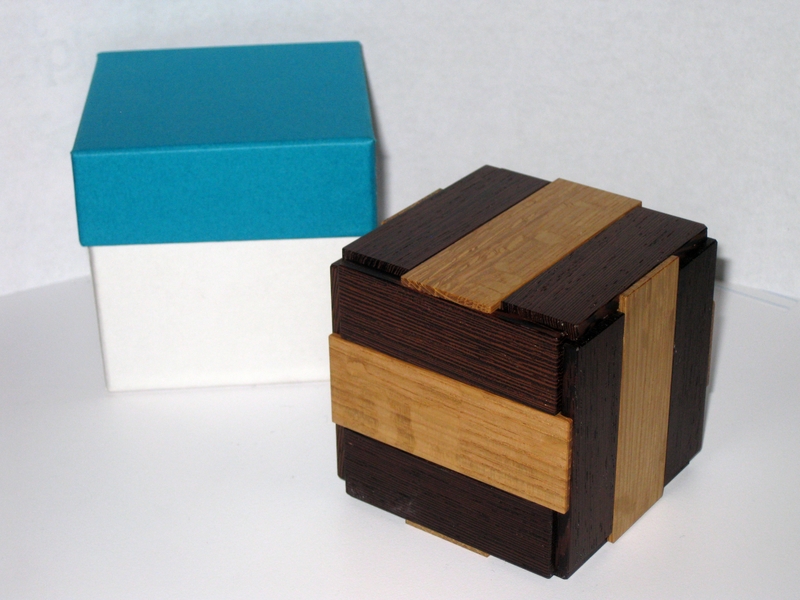 Well it's a cube, measuring 2.8" x 2.8" x 2.8" made from Birch, Magnolia, Wenge and Oak. As you can see from the image above the panels have been selected carefully to give a stunning external appearance, and the fit is so precise that it gives no hint as to how it will open. Sadly for me, on finding out how the box opens, it's a simple Expanding box, using the same design as Stewart Coffin's Expanding Box puzzle. It's a beautifully made copy, don't get me wrong, but from a puzzling aspect, it's certainly not a new idea. The particular copy I have been playing with is incredibly stiff, and the humidity changes, have caused it to become very challenging to open, which if you didn't know how it opened would make it near impossible to solve. It's a good looking box, but sadly it's not new, and unless you want a very good looking but costly copy of an expanding box puzzle, I'd say leave this one alone. Go have a look at some of Vinco's versions if you're just interested in the puzzle itself.